Discover how to create gorgeous and realistic landscape quilts from photographs with award-winning quilter and fabric artist Lenore Crawford! It's as easy as cut, fuse, paint and quilt! Award-winning quilter and fabric artist Lenore Crawford has created a simply amazing technique to create realistic-looking quilts from photographs. Her easy-to-learn technique includes creating a pattern from a photograph, building a palette of fabrics that match the photo, cutting and fusing the pieces together, and then adding small painted details to add depth and dimension before quilting. Lenore's original techniques have won her both accolades from her peers and prestigious awards from the American Quilter's Society. One of her landscape quilts is even on permanent display in the Historical Quilter's Museum in Padukah, Ky. With this all-new video class from Annie's, you can learn -- directly from Lenore -- how to create amazing quilts from your own photographs. You'll learn the techniques as Lenore demonstrates step-by-step the creation of the exclusive class project, Tuscan Countryside. 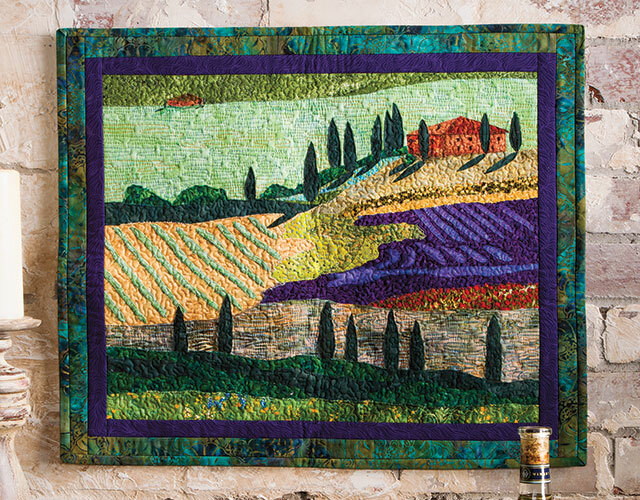 Create the Tuscan Countryside wall quilt, step-by-step. Convert your own photo into a quilt pattern. Size the pattern to what you want. Choose fabrics to use in a photo-based quilt pattern. Cut and fuse fabric pieces to create the design. Paint details to add dimension and depth to the design. Finish the piece with quilting, binding and hanging sleeves. Confident beginner crafters will be able to successfully make this class project. This is very well done. I appreciated the print out to outline steps to go with video as you watch. The instructor does a very nice job breaking it down. I will look for other classes with her in the future. Very good instructions. Looking forward to making more landscape quilts. Learned some good tips. Thanks Lenore. I feel I got my money's worth for this class. Lenore's instruction was quite clear. While I have no plans to make a quilt of the Tuscan Countryside, I feel I can take the techniques described and apply them to my own project, especially because I can go back and watch portions of the class again. I hope I will be able to translate assigning the fabrics to the areas of my project -- I think that will be the most difficult part for me. I especially appreciated that she didn't just fast forward over the repetitive portions of the project. She did enough of the project in real time to show that cutting and adhering the many pieces takes time and patience. Five star instructions. I love the idea of using an xacto knife. Also, I've been using Steam a Seam II Lite, but will have to try the misty fuse as sometimes too many layers causes bulk and is hard to sew thru. I see that Lenora layers very little with her cutting using the pattern. Great ideas and tips using her techniques. I usually am more of a free style landscaper, but can apply Lenore's technique for finer, smaller detailed elements. I have other classes and patterns from somewhere else and I have found this one to be a more extensive class. None of the others have explained how to use your own photo. This one has very detailed explanation, therefore, I have started this project. Excellent class with excellent instruction. I have been very pleased with the classes I have bought. Very pleased!